Like your vehicle, every HVAC system requires a bit of tender love and care in order to function at optimal capacity. Routine maintenance extends the life of your system and allows you to get the most out of your investment. If you want to ensure your air conditioning unit has a long lifespan, you must remember to schedule regular maintenance, which will allow you to catch small problems before they become large, costly and unmanageable! How Does AC Maintenance Work? In order to beat the Florida heat, you need an efficient air conditioning unit — and the only way to ensure efficiency is by keeping up with the maintenance of your unit. Some maintenance you can do yourself, such as changing the filters. This is one of the most important maintenance steps — a clean filter can lower your energy costs and put less strain on your system, which helps prolong its life. You can also visually inspect your unit for any obvious damage and keep an eye on your thermostat to make sure it is in proper, working condition. Beyond changing your air filters regularly, the absolute best way to ensure your air conditioning system is running optimally is to schedule professional maintenance. If left unchecked, your air conditioning system can lose efficiency from year to year. Don’t let that happen to you — let Certified Heating and Cooling Inc. take care of your air conditioning maintenance! At Certified Heating and Cooling Inc., we do air conditioning maintenance a little differently. We believe in providing the absolute best service to our customers for the best price — and that includes maintenance! 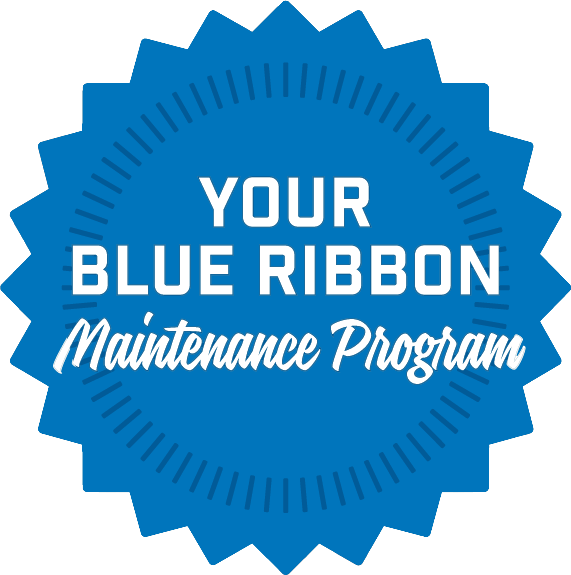 When you join our Blue Ribbon Maintenance Program, you’ll receive a 20-point seasonal inspections. It’s an affordable agreement that protects the longevity and performance of your air conditioning system. Your investment pays for itself through energy and repair savings. Your comfort specialist will inspect and clean your air conditioning system. They’ll ensure your system has proper refrigeration charge, in addition to inspecting and cleaning other parts of your system. As a Blue Ribbon Maintenance Program member, you’ll receive free reminders to schedule your seasonal inspections, priority service, a 100 percent customer satisfaction guarantee and exclusive discounts. Check the thermostat for proper location and temperature calibration. Inspect the electrical wiring for missing insulation and brittle or discolored insulation. Replace as necessary. Check all electrical connections for loose terminations. Check the blower and blower motor for dirt and build up. Lubricate the blower motor as necessary. Inspect all accessible ductwork and connections for crushed or damaged ducts and leaking connections. Flush the condensate drain line add Algaecide pan tablets when applicable. Make sure a condensate trap is installed. Check for proper clearance between the condensing unit and the house. Examine the condenser for dirt, leaves, cottonwood seeds, weeds, and any accumulation in general. Spray condenser coil with approved cleaning agent to protect the integrity of the coil. Open the outdoor electrical section and clean out all cobwebs, insects, or other accumulation of dirt and dust. Inspect the electrical wiring for missing insulation and brittle or discolored insulation. Replace as necessary. Check all electrical connections for loose terminations and for signs of overheating and discoloration. Carefully look over any run or start capacitors for signs of overheating, check to make sure they are within the normal operating guidelines. Inspect the electrical contacts on the compressor contactor for discoloration, contact pitting, and excessive wear. Check for missing or deteriorated insulation on the suction line and replace as necessary. Check the system charge using the correct method for the type of system. The Florida heat can take a toll on your air conditioning unit. When you use your AC nearly year-round, maintenance is even more important. It is critical to have your air conditioning system cleaned and checked for optimal performance, efficiency and safety at least once a year — or twice, if possible! At Certified Heating and Cooling Inc., we are here to provide you with regular inspections and maintenance services, as well as offer valuable tips on how to properly self-maintain your air conditioning system. You should never waste money on an inefficient air conditioner or pay extra for unnecessary repairs — and, with regular maintenance, you won’t! At Certified Heating and Cooling Inc., our customer is our number one priority. We never sell you equipment you don’t need, and we’re experts at helping you get the most for your money. If you are in need of air conditioning maintenance, or just looking for tips on when it’s best to maintain your AC unit, give us a call!